When you first commit to a challenge its always good to research – tap into other people’s experiences and then assess your own chosen direction. 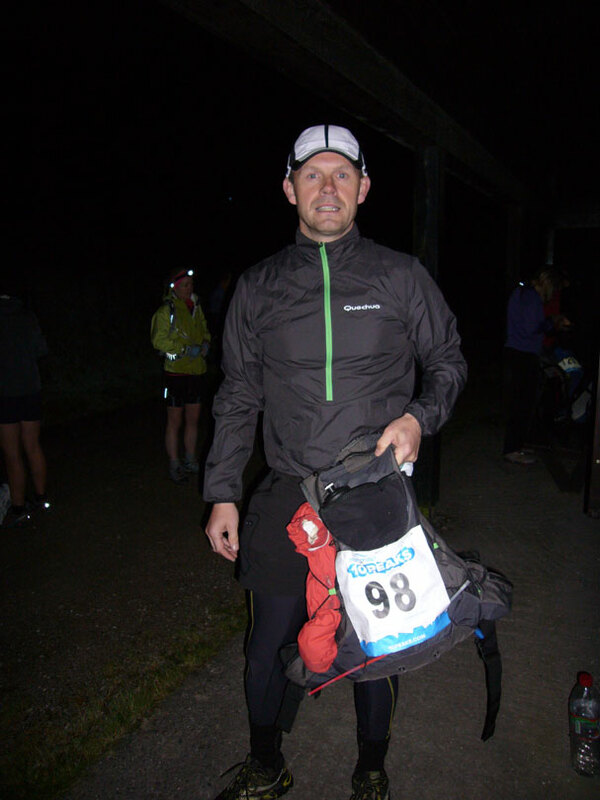 This is my blog on how I completed the 10 peaks in 2012, an endurance race on foot over the highest 10 peaks in England to be completed with a 24hour cut off. Before this years race only 52 people had managed this. It is important to understand, I have previously ran extreme distances, mostly with weight, be it 25 years ago. I therefore have the belief and knowledge that my body is capable. This really is the starting point. Until you push – way beyond your comfort levels and your conceivable limits, you will not have the confidence, and believe me your body really is an impressive piece of kit. It will always exceed your expectations, no matter what you throw at it. Get to know your body – it will impress you and confidence is a massive resource to draw on. With the right mental attitude you really are pretty invincible. So here we are, last Christmas Eve, I did a park run, a 3 mile marked route in 24.38. (just to show you I am no Seb Coe). This is my base fitness, if I haven’t run for a year this is my kind of pace. I have kept a run activity diary for the last 30 years – every time I run I measure the distance, terrain, timings – it’s a great motivator and focuses your goals, and benchmarks you against you. My runs for the next 8 weeks were intermittent with hopefully 2 runs per week between 4 & 6 miles. In February I start stairs training (running up 6 flights to strengthen the legs – as fast as you can up and as slow as you need down) do this for 10 mins then complete a 30 min run – great workout. We visit the Lakes in March and do part of the 10 peaks route, Angle tarn to Scafell pike, about 10% of the route (this takes me just under 8 hours) at a reasonable to stiff pace – I’m beginning to get in the zone now – I leave “Survival Bob” and “Vietnam Tim” descending onto Mickledore and run on. Up Scafell via Lord’s Rake then cut back just after the Rake and free climb up one of the re- entrants. Not to be advised – silly boy, have a few moments, and luck not skill lets me top out. Down the Rake, under the Buttress and run the Corridor route. We wake up to snow the next day and go for a 4 hour blast through 10 inches on Great End. Start to crank it up in March – start running on occasion depleted of Water And Food to harden the body to it. The body responds well after a few “hit the wall incidents”. My run program is now alternate 8 miles and 6 miles 2-3 per week and ice baths after every run. Some fartlek, hill work V02 and threshold training thrown in. There are some very hot day runs and I feel good about my progress. I do 19 miles to beef up the miles and my knees hurt like hell. After a day or so I begin to worry. I suspend all impact training for week or two then do it again. Same problem and the pain again stays for 2 days. I decide to start MTB (low impact) but I can’t push myself on a bike as I do when I run. I ride 1 day then run the next, still pain. My body needs rest – I do nothing 1 week then run, pain – rest 1 week – pain. My fitness is going down the pan. July is looming and I’ve thrown away 5 months training – I need a rethink. My wife drags me, kicking and screaming to a specialist – I don’t want to hear someone utter the words – “you can’t do the race” especially if I’m paying them! He doesn’t, but tells me I’ve over trained and damaged myself but it is feasible to carry on – progressively. This is a completely new outlook, I have never been careful, it doesn’t exist in my training – never has. This is the last thing I need, starting to doubt my body with 6 weeks to go. This is not the kind of event to carry an injury into – when asked will you start the answer has always been yes, will you complete is now beginning to be asked, of course I will (but what damage I do will only be a concern afterwards). I get the bike out again 4.7 miles hard, then run 4.7 miles and this is the run up to the event 2 x a week. Nothing silly – just consistent. I visit my mate Jim, a Triathlete coach and sports masseuse who gives me a once over, he encourages me to run morning and night but less distance – just up to the start of my pain threshold – this seems to work well. The week before the 10 peaks I do a 3 mile park run -22.17, I’ll take that. Every Monday and Wednesday 4.7 miles – Ice bath then rest. In the final week I’m drinking 18 pints of water per day and from Wednesday carb loading – as many as the body will take. Hole chickens, potatoes, pasta, vegetables rice. The drive up to the Lakes I have to stop 5 times for a pee and now I have added a malto – dextrine to further carb load. After arriving and signing on I go for a meal, I am full before I order – mussels and then rib eye steak, heavy on the vegetables. The mind set is that I could eat both no matter how full, and it’s an old trick to get some meat in the stomach. Tomorrow my life will be gel-ville! Rather than booking a hotel I sleep in my car – eventually close my eyes at 10.30 toss and turn for a while, then just when I am snoozing I have a few texts from friends ” are you asleep yet? ” The last ones coming at 12.30am. Wonder where they get that devilment from? As long as they are happy. Alarm goes at 2.15 am – my wife has stayed up to text me good luck. Here we go – I pack and repack my bag 10 times, this isn’t nervous energy, I need to know where every bit of kit is. In less than 2 hours I will be tired and so the brain needs to be pre programmed, I don’t want to be faffing around looking for my foot care kit or my Gore-Tex or survival shelter. Alpen for brekky and three cups of tea. I cram my pockets full of hobnob breakfast bars, grab 1 litre of water to slurp on the coach and we are off. The coach leaves at 3.15am and we arrive at Swirls Carpark for 3.45am. 15 mins to go, a couple of pees in the hedge to mark the territory. I crack my light sticks for my back pack but decide not to wear a headlight which is fine until everyone you speak to looks directly at you and their light beams in my eyes ruining my night vision. 4am I push my way to the front – my Mantra for 4 months has been – run your own race – run your own race. On your marks…GO! – So the guy who hasn’t ran further than 19 miles since ’91, you guessed it, I’m in the lead, not for too long. only 1/4 of the way up Hellvellyn and they start passing not ones and twos but streams. I’m sweating like a banshee – breathe, relax. Top out at 54 mins then I open my stride and start over taking, and I start singing as I run, something that I do when I ride enduro – people do actually look at you like you’re an ALIEN! Down to check point 1 and top up my water bring on the Bog., let’s see if it lives up to it’s reputation. It’s up the slog to High Raise that I meet “Carlsberg”, it’s light now and he has a GPS, we are about the same pace and keep toeing and froeing, until, we come to a re entrant. He goes due North – “where’s he going? He must know, he has a GPS! Do your own Nav Rob,” I push on, up my route and I am convinced that I will never see him a again. Poor scouser, lost in the hills. We later meet up, 2 valleys later and I realise that he’s not a scouser, he’s from Denmark . This amuses me all the way to Bow Fell, where I self debate (pub style) what comes from Denmark – from the Rickshaw to clogs. It turns out he’s flown over to race. Must be good! Why isn’t he in front of me then? At this point I decide, we’re not having a guy fly in and take the medal off a Brit, he was know my focus. This is mountain racing at its best. Thinking rubbish, anything to take the mind of your body screaming. Bow fell comes at 4.20. I had allowed at least another hour – had I gone out too quick? I felt good. Push on – out of the fractured rock and I’m running again – I pass “the soldier ants” three young guys that just plod along at one speed but just keep on going. Every time they pass me they say “pace your self it’s a long day” – every time! – This has got to stop! I go through Check point 2 in 14th, there is an Irish guy who has hit the wall and is re energising with food the Check Point guys are offering, feeding him piece meal like a tamed fox. That makes me 13th. A sense of pride overwhelms me, then Captain Competitive takes over, here comes a top 10. I open the legs, writing the speech as I go. Lord’s Rake and Scafell come and go, the “soldier ants” are well beaten and I’m about 5 minutes behind Carlsberg. Out of the Rake, I drop straight off (I’m not going back up the Pike) and cut around under the Buttress to pickup the Corridor Route, I hammer down there. It’s hot and I’m roasting up. By now there has been plenty of tears and a few “Adriane!” Rocky moments where I call out my wife and children’s names, (all 3, you can’t have favourites!) To my knowledge I’m the only one to go this way, but it pays dividends I reckon it saves minutes and when I start up Great Gable I see Carlsberg way below, I’ve pulled 10 mins on him but my climbing has seriously slowed the body is complaining. At the top I’m told I’m eleventh (remember some choose the alternative and go down to Wasdale) I come out of the CP and there are two guys picking their way down. I bomb off, I’m 9th now! Check point 3 and refill with water, only enough for the Pillar out and back. I run on hard and fast the legs feel good; all of a sudden, where’s the path? I begin contouring then I look up and the two guys I passed are high up on a path – I am fuming, I’ve cost myself 100m of climbing and 20 mins. The climb up Sail Beck takes it out of me, but I want my place back. It takes me all the way to Pillar to catch them and I tuck in behind to slow the heart rate. It’s only now when the throttle’s off that I realise everything hurts, my knees, my feet, my quads are more than fatigued. I can not keep their pace and I regularly fall back 50m then gather and pull them back in. Just before Honister I pull in front and arrive a few minutes before them. Shoes off, attend my blisters (a lady takes some photos of my damaged feet for a write up on the event) and fresh socks. I have a cup of tea and a jacket potato and I’m off again. I’ve calculated at this point I won’t need my headtorch and leave it at Honister, oops ! Climbing out of the pass towards Dales Head I am now chasing the Wakefield Cockney and I think I have lost a few places with the length of my stop, probably 25 mins stationary. I put myself about 13/14th. My feet needed the TLC so it was an investment. Give me a down, or flat and I will make the time up. My climbing is now monotonous, the pain is searing. Just a 12.5km into CP5 and 20km up and down Skiddaw left, dig in we’re practically home and dry. Carlsberg comes flying past me, his legs are strong. That Medal might be going aboard. I channel my effort, enjoy the pain, don’t fight it. Up, up, up it just keeps going the rest is taking its toll. I reach the top and Carlsberg is 1000m gone, but I see someone else about half way between us. You are going down. I lift my speed, I categorise this guy as a credit. Within 15mins I’ve caught and passed him, I get myself on a sheep track and get my head down, I have spent many hours like this running in pain pushing the threshold. You need to love it or you would simply stop. 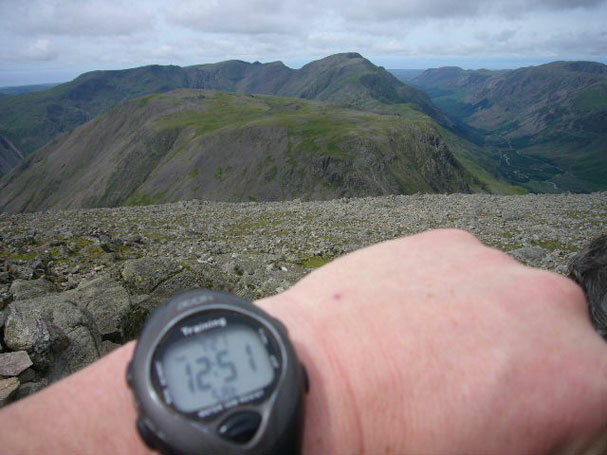 Check point 5 comes – 12.5km in 2.20 over the fells. The first climb took 45 mins plus, I’m happy with that, my body is far from fresh. I have a few minor nav errors on the way, this costs me five mins – focus your mind – be clever- not quick . 20 km from here, up and down Skiddaw. I run hard to the foot I have lost the ability to climb so the transitions have to be swift. This is a banker against the chasing pack. I start on Skiddaw at 20.00 on the dot. I can see a guy up ahead he’s thirty mins in front and after my first few steps I realise he’s out of my reach. My climbing now consists of 10 steps, then stop to control the pain. In my head I compare this to child birth (I am nearly passed laughing) I hope I just don’t bear down, it won’t take much, the amount of gels I’ve had! Come on crack your face! I gaze down and spot three chasers. My heart sinks, I only have at most 15 mins, and that’s at my pace, they are climbing quicker. Pain courses through me, the only thing I can do is try and offset the inevitable, they will catch me, just make sure it’s near the top. I know I can find a last descent and to date no one has kept with me. At every pain break I glance down – closing. I try every trick in the book -at false ridge lines put on a spurt to physiologically break them, it doesn’t work, they keep coming – tirelessly like Orks. Stop looking down – run your own race – I need a re focus. Like the pain, enjoy its company, count to 100s before a stop. I think my record reaches 30 after 4 or 5 attempts. There is never doubt about finishing, it is my 11th place that I am now fighting for – if I lost a limb at this stage I would carry it home in my teeth. I revert to my initial strategy – they will come through I just need to stay in touch. I begin to focus on the light and how quickly it is fading. I may be in trouble, without any light source trying to nav over unknown terrain. This additional pressure is shrugged off – I cannot physically move any quicker than I am! You can always give more, I tell myself come on lets have it, I try to convince myself that the pace has lifted but I know it hasn’t. I look over my shoulder they are 100m behind – this is closed down very briskly The Orks have run me down – we exchange pleasantries ” how are you lads?” they are more that hospitable – “we are doing 9 mins on, and 1 min off – tuck in behind” says the Chief Ork with a military honed voice. I only just have time to say “No, I’ll do my own thing” knowing I can’t sustain that pace. I must look high Mileage, very part worn by now. They pass me at the Tarn I try to keep with them – but I cannot. At every ninth minute they pause – I have 60 seconds of pull back – they gaze at me, the time ticking then they are off. As the false peak of Skiddaw tops and the climb steepness lessens I spot my opportunity – like a worn gearbox that’s been missing gears – all of a sudden I find one, engage and actually feel like I’m moving forward. My spirit lifts, my tempo increases and I am gaining on the Orks – I must catch them before the top – even if that’s where they have to carry me down from – I will catch them. The light is going now and as the eyes adjust I stumble on my run, the broken surface catching me out and spiking additional pain through my body. The Orks are less than a minute in front – push on! I focus 10 feet in front of me and go into autopilot – I enjoy the pain – I focus on what I want, rather than what I need. I am now 10 paces behind, we can now make out a wind swept man at the Trig point, the top of Skiddaw. I go into the check point with the lead Ork, we all top out and begin the descent as one “I don’t have a light and need to rattle on”. “You push on, do your own race – but if you get into trouble wait for us and you can go in the middle”. Very decent, I am impressed with the camaraderie – I really don’t deserve their benevolence – all I have been doing for the last 2 hours is seeing them as the enemy. Scratch that – I don’t have time for either reason or emotions, my load is heavy enough. Focus on 11th – night nav and 5miles. My run quickens, again the quads complain, the knees too, they can shut up for a start. The pace is good – the incline not too bad and the surface is workable. The pain comes when it steepens – I have to brake and the body doesn’t like this resistance. All of a sudden it hits me – my focus is so one dimensional I realise it’s nearly totally dark – map, map, map. I stop and try to focus on the map – I struggle to make out anything – I will just run for the lights of Keswick and make it out when I get there. All of a sudden the map begins to be legible. I find Skiddaw and the descent, there is a car park but I cannot see the path the other side. I look up at the Orks headlights dancing about behind me – mark – 6 mins later I know my advantage. They are well beaten – but I need to keep this last part clean. I run under the cover of a wood and realise just how much moonlight there is/ was. I am completely in the dark. I instantly drop to the press up position looking for any light to show me the way out. I congratulate myself on how switched on I still am, I am walking forwards like you do in a strange hotel room when you can’t find the the light – expecting at any moment to find something hard that’s going to hurt. I stumble and go down – a silly twist or sprain and I won’t finish. Oh yes I will – I calculate that I could now crawl and still make the 24hrs. The wood thins – running naturally occurs, I push on – stumbling and falling a few times. I feel no pain. I can hear a road, the outskirts – push – my pace is good. The path eventually spits me out on a road – the proposed route says right then onto a disused rail line for the last 600m – my car is parked 500m to the left from here and the hotel less than 100m through a short cut I have found so equal distance. Against all sanity I turn right and take the route I do not know – the other way would be down the road – well defined, not lit but you could make it out easily. I was always trained running on roads is a no – no. This is the only reason I can fathom and trust me I have micro examined this one. I climb up onto the rail line – overgrown and pitch black – I fumble around for 200m getting irate – that’s it – I’m out of here! I run down the embankment through briars and thorns – I couldn’t care – I am being chased down by the Orks – fully lit up – they will make short work of this. I end up in a pile in a grassy field. My natural compass sets me off running parallel to the rail line. All of sudden I make out a large well lit building and I push, running hard. My lungs are screaming I enjoy the fact that a different part of my body is complaining. What’s that noise – it’s moving water – what the? I close in – its a river. If that’s the case – all of a sudden my brain processes the error – I’ve over run by 500m, I’m in a park – it registers, I hang a left run up 10 steps like they are not there, through the railings and onto the road. This is where I was going to park the car, but it’s double yellows. I bound toward the hotel, push – I pass the Wakefield Cockney walking away after finishing, I wave “well done – I think your 10th” he says. I don’t think so. He must have thought – why’s he coming from this way? I push on – my brain calculates I am doing about 7 min miles – not a bad finish but it’s panic running. I cross the car park jump up the steps and straight through the Foyer and past the Grand dining area in my muddy wet clobber, I round the corner and see the lit RV- they begin to applaud – I run into the room. My heart hits the floor – the Orks are checking in. The guys turn and smile acknowledgement. I just stare – snap out of it – it’s over. I go over and shake their hands. My brain struggles to process – these guys have been my focus and motivation to push through the pain for the last 3 hours – they have been the enemy. It’s now over, it’s like someone telling their fierce dog to be nice – I just hope the guys don’t see this – they have been nothing but helpful – its just a mixture of adrenalin and disappointment. It’s my fault not theirs. I take in the room – there are a handful of hobbling bodies, a running buffet – people asleep in corners. Some have been coached back from Honister – some are the leading pack. I see Carlsberg, he looks dazed – I tell him I was worried I would never see him again when he went a totally different way up High Raise. I have a chat with the Orks, I don’t think they are even together but have teamed up to finish the race. After 30 minutes I stagger the 100m to the car – climb in the back and try to sleep – the last 500m playing over in my mind – this hurts more than my body, why – why – I feel like the French man at the Open – 3 shots ahead, “I’ll play that out of the water rather than take a drop” – he says he never relives it, I don’t believe him or the American Snow boarder who had everyone beat at the Winter Olympics, decided to do a tail grab over the last jump and fell. I can’t even drift into sleep to escape – I hurt everywhere. My knees, my quads my hips, loins but most of all my pride. Then the texts and calls begin, are you still alive? I do what I very seldom do, and turn my phone off. After 2 hours of 50 winks and plenty of tossing and turning and self analysis I get in the front and drive home. Someone there loves me – ’cause I don’t at the moment. I was happy with my performance, even though my mum would have beaten me up Skiddaw. If I would have finished 11th I would have been euphoric. I made 1 error of judgement and it kills me, even today. People who know me well have said 11th wouldn’t have been good enough, I always want more – they are right – that’s a competitive mind, but 11th was mine and I threw it away. When I finished I uttered the Steve Redgrave “if anyone ever sees me near my fell shoes they have permission to shoot me”, within the hour I was planning next years top 10 – I just feel I could take 30 mins off. There is a sub 18.5 hours in me. I can do a top 10. I could not walk up or down stairs the next day. It took me over a week to walk normally especially down stairs. Remember – running is good for you! Allegedly! The people that matter are the ones who sponsored me – you have made a difference to people you don’t know and will never meet by throwing your hard earned pounds at a guy who has been having a mid life crisis for the last 10 years….I salute you. Many thanks. Over £450 with gift aid.